Image courtesy of the U.S. Census Bureau. Walk through the steps of finding Census tracts associated with you neighborhood using the three different tools mentioned above. While this includes some Seattle specific resources and neighborhood maps, the same principles can be applied to any city. The most difficult part of defining your Census geography is figuring out how Census designated geographies overlay with the streets and neighborhoods we know from everyday life. You will need to determine what Census Tracts, Block Groups and Blocks best match up with your community to find the Census Data you need. These boundaries may not match up exactly with the official boundaries of your community, but using street maps and Census Tract & Block maps you will be able to define an area that will work best for your research. 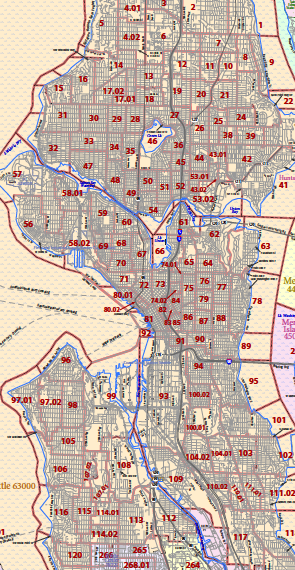 The Seattle Neighborhood Maps on the City of Seattle's website will help you identify the generally accepted street boundaries for your neighborhood. For detailed street maps, check out the Thomas Guide King, Pierce, & Snohomish Counties street guide in the library (Suzzallo Ground Floor Reference G1488.K3 R36 2010) or use a web based mapping tool such as Yahoo! Maps or Google Maps. For detailed online Census Tract, Block Group & Block information for 1990 and 2000, you can use the Census Bureau Reference Maps in PDF or use the mapping applications in American Factfinder. If you only need Census Tract information, Social Explorer's Mapping function is a great option. Don’t forget! Census tract numbers & boundaries may change over time. Check all your Census years before making a final decision on Community boundaries. Remember, the farther back in time you go, the larger your Census Tracts are likely to be. Social Explorer (go to “maps” tab) is an online interactive mapping tool that can help you identify Census Tracts and extract selected statistics for your community back to 1950. Social Explorer does not do identify blocks or block groups, but does include streets and is an excellent way to quickly compare tract boundaries over time. The City of Seattle has developed several dozen Community Reporting Areas or CRA's. Need help? Call the Government Publications, Maps, Microforms & Newspapers help desk at (206) 543-4164 during desk hours. You can also consult the Ask Us! reference service (24/7).